Notes: Scarce slogan on booklet stamps. 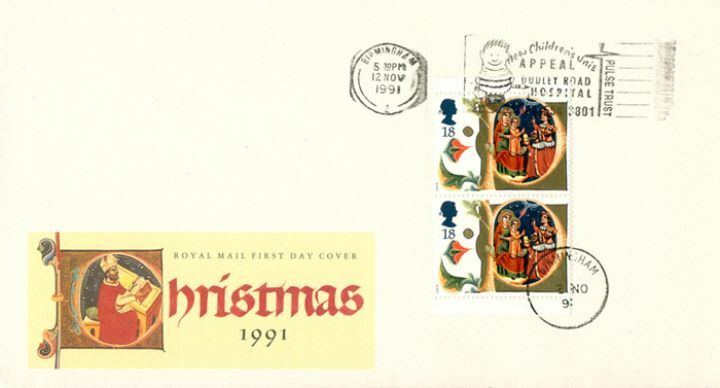 The above Royal Mail Christmas: £3.60 Christmas stamps were issued on 12 November 1991 by Royal Mail and feature the following stamp designs: . The Illuminated Manuscript first day cover with the Birmingham, New Children's Unit Appeal Dudley Road Hospital, Slogan Postmark postmark has been produced by Royal Mail/Post Office and features these stamps which can make a very collectible and lovely gift.